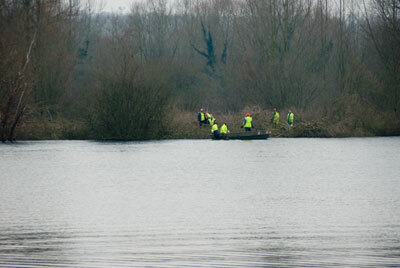 RWE Npower have started to wreak their destruction at Thrupp Lake. 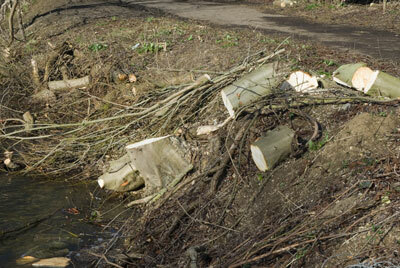 The massacre of wildlife began, somewhat aptly, on St Valentines Day. 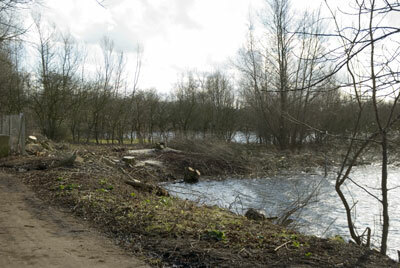 A protester, who, up until then, had been engaged in a lonely vigil outside the Sandles property, enduring some of the coldest and wettest weather of the winter, was arrested for daring to trespass onto npower’s land in an attempt to persuade men wielding chainsaws to stop cutting down trees. He was pinned to the ground by several goons for half a hour before being allowed to sit up. After over an hour had elapsed, the regular police turned up, in significant numbers, and removed the protestor, who somehow subsequently ended up in hospital having sustained serious injury. On Thursday, RWE npower issued a High Court injunction, in the name of John Rainford, the power station manager, effectively preventing anyone from photographing the goons or any of the activities underway at the Lake. The injunction was issued under the Protection from Harassment Act 1997, which is a draconian piece of legislation intended for dealing with quite different circumstances. It seems that the goons felt that they were being harassed by the local people (!) and demanded protection. The reality, and probable intended purpose, is that the injunction effectively prohibits lawful protest and, through restrictions on photography, proper reporting what is currently going on at the lakes. TV companies, for example, are not interested in anything they cannot get pictures of, pictures that they can publish. This is a serious piece of legislation that was never intended to be used in this way. It is also a blanket order that, although it is addressed to named defendants, actually applies to anyone to whom notice of its terms have been given (although nobody is exactly sure what that means – it could be like the plague, so that even coming into contact with it or knowing about it makes it applicable to you). Anyway, it is being scattered about like infectious confetti onto anyone visiting the lakes. Once this is done, anyone actively opposed to npower’s plans, and for some reason this has included the press and media, becomes subject to all sorts of restrictions. This includes loitering within 5 yards of a goon, npower contractor or employee, or photographing them; and failing to obey their instructions will make you liable to arrest. Meanwhile, in the background, the rasping sound of chainsaws continues unabated. 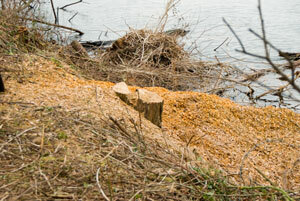 Several islands have since been cleared of trees, and the destruction is expected to continue until the end of the month. A protest march is planned for tomorrow, Saturday 17 February. For update on this, see subsequent News Story. 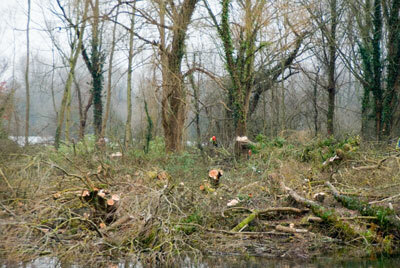 Pictures showing the havoc being wreaked by RWE npower at Thrupp Lake. They speak for themselves. 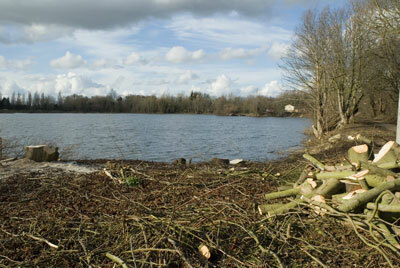 More pictures showing the destruction being wreaked by RWE npower at Thrupp Lake. 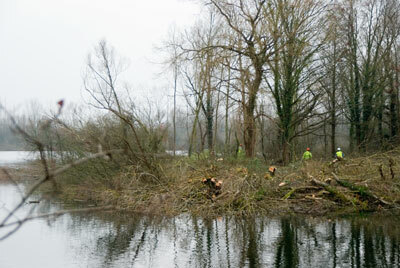 Above and below: several large trees, including a horse chestnut, have been cut down at the SE corner of the lake. 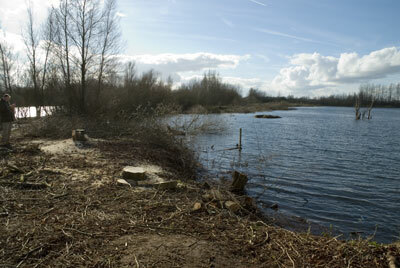 The whole place is littered with bits of trees, many floating in the lake. 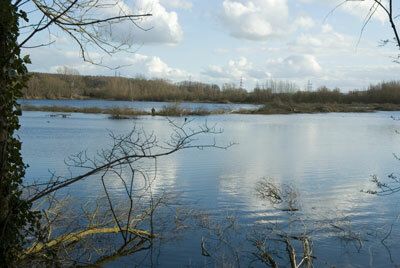 Above: View from the SE corner of the lake, looking towards Sandles. 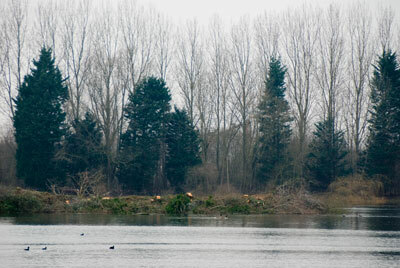 as seen from the NW corner of the lake.